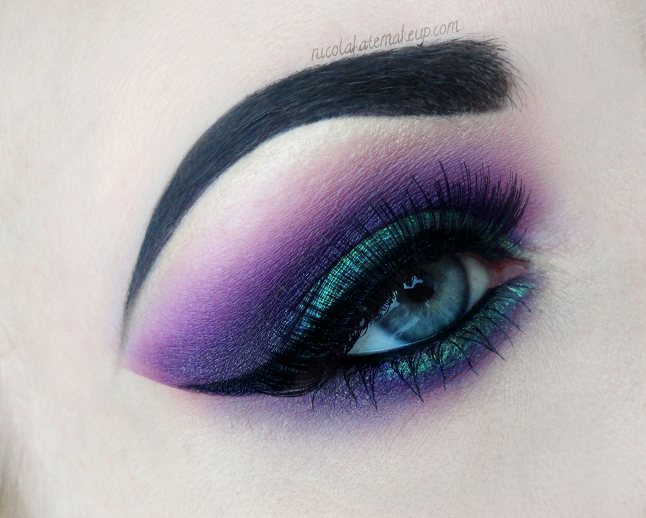 Nicola Kate Makeup: Maleficent - Also 20% off your Concrete Minerals Order! Maleficent - Also 20% off your Concrete Minerals Order! Hi, make-up lovers, I have a great offer to share with you today! Firstly, today I bring you yet another look that would be perfect for a more glamorous Halloween costume, inspired by none other than than the ultimate Disney villain (Maleficent, of course!). Naturally - as I'm so excited about them - I immediately reached for my Concrete Minerals eyeshadows to put this together! Like in my previous look, I kept my complexion as pale as possible. And it would hardly be a Maleficent inspired look without jet black, villain-esque eyebrows to accompany it, would it? To complete the look, I paired it with my current favourite lashes from Girls With Attitude. And now for the exciting part! I'm able to offer all of my lovely readers a unique discount code that will get you a whole 20% off your next Concrete Minerals order! My coupon code is valid all day Friday through Sunday up until 11:59PM PST, and I urge you to take advantage! To receive 20% off your whole order, enter my coupon code 'NICOLA20' at the checkout, and enjoy! It's gorgeous! In fact, all of the CM shadows I have are stunning. I think Swamped is one of my favourite colours, though! Thank you, honey!